Troubleshoot Connect by using log files and the solutions to common problems. If you cannot resolve the issues, collect support information. If you are having trouble with a connection, you can run the connection outside of the scheduled intervals. After you create the connection, a detail page about the connection is displayed. Click Run Now to run the connection outside of the scheduled intervals that you configured. Look at the Runs tab for more information about each run for that connection. Click an individual run to view the logs and download the run log. If you need more data, you can edit the connection to update the Log Level value. If the IP address for a connection is on an internal network, only a Tanium administrator can run the connection by default. Click Settings on the Connect home page, and click the General Settings tab if needed. Enable the Allow Connections to Internal IPs setting to allow anyone to run connections to IPs on an internal network. To adjust the number of days before log files are removed, click Settings on the Connect home page. Click the General Settings tab if needed. Edit the number of days in the Connection Run Log Expiration field and click Save. To adjust the log level, choose a log level from the Connect Service Log Level drop-down menu and click Save. To collect logs, click Help , then the Troubleshooting tab. Click Collect to download a package that includes logs to send to support. 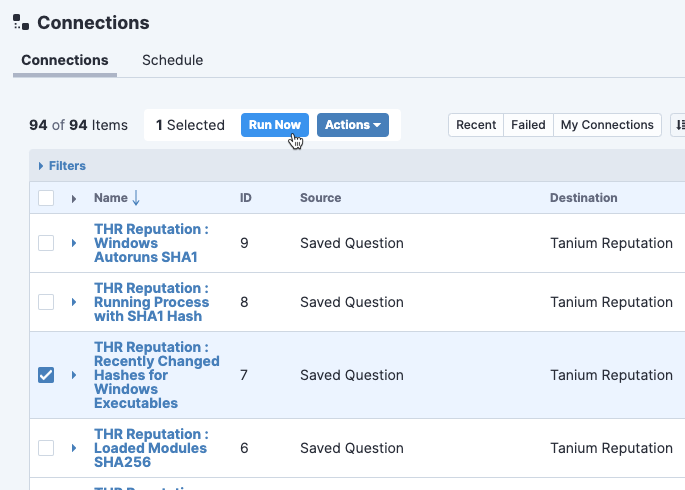 If you cannot get to the Connect Workbench to collect logs, for example, after an installation problem, use the following steps to collect logs from the Tanium™ Module Server. On your Module Server, open an administrative command prompt. Right-click the Start menu and select Command Prompt (Admin). From the command prompt, go to the \Program Files\Tanium\Tanium Module Server\services\connect directory. Verify that the Connect service is running on your Module Server. To view the running services, click Start > Run. Type services.msc and click OK. Verify that Connect is in the list and that the service is running. Check the service logs for any errors or messages about insufficient rights for the user. The Connect service records logs in the \Program Files\Tanium\Tanium Module Server\services\connect-files\logs\server.log file. The Connect service records logs in the \Program Files\Tanium\Tanium Module Server\services\connect-files\logs\server.log file. Connect stores information about connections and user settings in the \Program Files\Tanium\Tanium Module Server\services\connect-files\config\connect.db file. Do not edit the connect.db file unless you are advised by your TAM. Connections generate a log file for each run of the connection. The run logs are in the \Program Files\Tanium\Tanium Module Server\services\connect-files\logs\connections\ directory. Click Info and note the Workbench and Service versions. The basic Connect module uninstallation is designed so that the data you have collected is restored if you later decide to reinstall Connect. In some cases, you might want to start "clean" and not restore the data. To do this, you must manually remove some files. Consult with your TAM before you uninstall or reinstall Connect. Sign into the Tanium Console as a user with the Administrator role. Review the summary and click Proceed with Uninstall. When prompted to confirm, enter your password. If you later import the Connect solution, the previous data is restored. Uninstall Connect so data is restored on reinstall. Manually delete the \Program Files\Tanium\Tanium Module Server\services\connect-files\ directory. Deleting the connect-files directory removes all existing Connect data. All logs, output, the Connect database, and any other Connect data is deleted. If you later import the Connect solution, the previous data is not restored.